RRBJ just realized linking is the lazy way to go. We can avoid wiggling the cordless mouse to cut and paste if you'll just go here and see what that world traveling Trudeau says about Shreveport's Farmers' Market. We'll be stopping by for some more of Pan's Pantry Drunken Peach Preserves since husband has given up his generic jelly and eaten all of our fancy stuff. It was kind of sweet yesterday at the market. 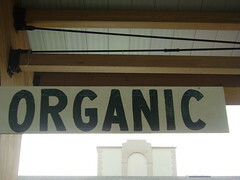 During a very, very rare lull, an older fruit seller approached me and asked me what "organic" meant. I informed her and she was giddy to find her produce qualified. It made me giddy, too, to find that sometimes people are doing things right even before it's fashionable or necessary! As they say in the Big Easy "you got dat right!"